I'm teaching myself to sew, which is no easy task, but thanks to the world wide web there are hundreds if not thousands of sewing tutorials to try. I would very much like start creating some lovely upcycled clothing items, similar to those seen on Wardrobe Refashion. Clothes that have been reworked into something more flattering, unique and special. Recycled Fashion at its best! I am trying out some online sewing projects at home, which are not always related to clothing, but are great to get familiar with fabric, patterns and sewing machine settings. 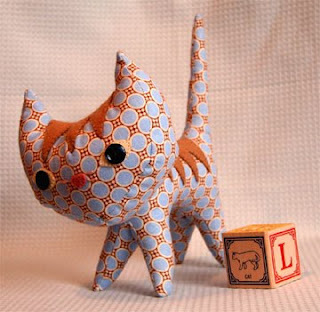 I found this cute little 'pointy kitty' soft toy tutorial c/o WeeWonderfuls. Here is my attempt, made from fabric scraps my Mum gave to me. It turned out OK? Arent these just the most ridiculous yet hilarious upcycled things you've ever seen? Particularly the cats with the shopping bag handles left on! Genius. yes, that's cool, the plastic bag recycling 'pun'. i'm always into what a person can do with a carrier bag, that one big, huge let down (the plastic wste bag) to modern society... this is great. your attempt at making a kitty looks really good, btw! Ah thank you for your comment. It is great to see what people can do with plastic bags, even if it is amusing photoshoots with crazy cat toys..! Hahaha... I love it!! Baggy kitties!! I think you'll find sewing really easy. I still get stuck with my thread tension which just peeves me. One think I learnt which was really helpful was... If you top thread starts to go nuts check the bobbin first. If your bobbin is going nuts check your top thread! Works every time!! Thanks for stopping past my blog!! Thoes cats are the bomb. Where they simple to make. I love the undies. did you try and make some boots with the flates, like the picture was shown. I love your blog again and again.